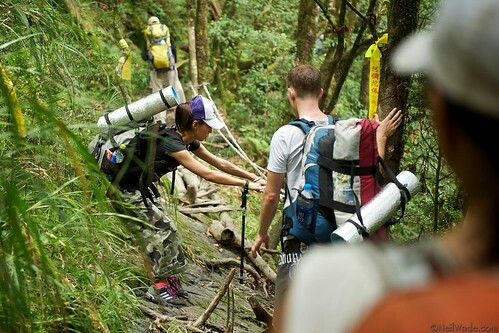 This hike can easily be done in a weekend from Taipei. We started off at 8:20 am from Xindian and, even with the heavy traffic, made it to the trail head by 11:00. The trail is rough but easy to follow. It starts up a steep set of stairs but then flattens out for most of the 1.5 hours to the water source. After that, the trail starts to climb towards the 1,300m lake. It was a hot and sunny day, so we were happy the trail stays in the forest for its entire length, giving shelter from the sun’s hot rays. Unfortunately, by the time we got to the lake, the sun was hidden by the usual afternoon mountains clouds. After dinner, a little rain even fell, forcing everyone to their tents for an early evening. We awoke the next morning to the clouds being beautifully burned off the lake, revealing blue skies and reminding us why we go to all the effort to hike to these beautiful places. A quick stop for adjustments at the beginning of the hike. 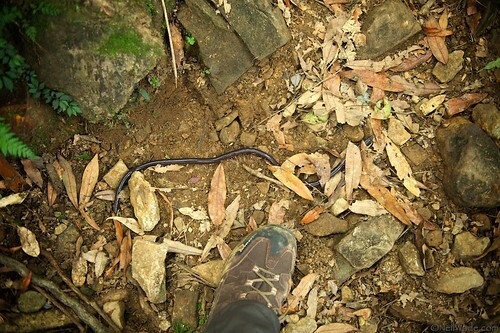 My boot is a US size 11, so that's about a 24 inch (60cm) worm. 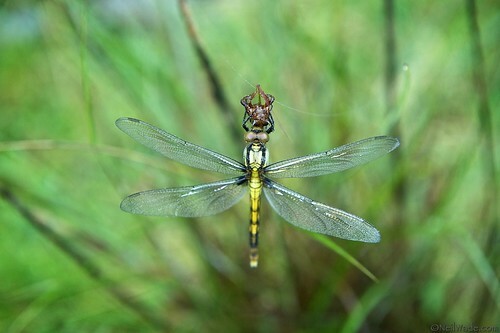 This dragonfly hatched just that morning. The trail had a couple of difficult places to traverse, but nothing too difficult. The forest immediately surrounding the lake is often covered in fog. This causes this beautiful moss to grow on everything. 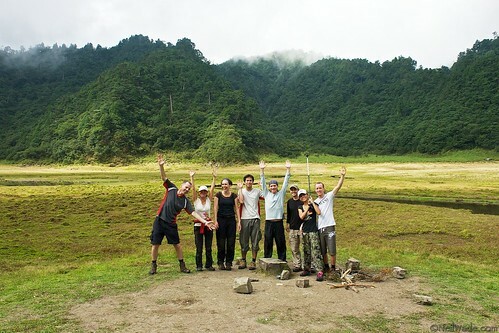 Taiwan Adventure's Songluohu Hiking Group photo. 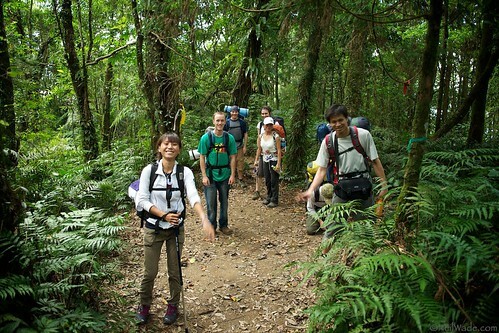 Join out hiking group on facebook for information on future hikes! I just stumbled upon your site while googling for natural light portraits. Excellent work!!! I am just getting into serious photography and your blog is a real source of inspiration! I do not have a website at the moment as I am trying to build up my portfolio. You have some really nice photographs. The first is particularly striking. 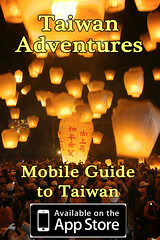 I also love hiking, but I’ve never gone to Taiwan. I do not know if in Taiwan there are lakes and hills so beautiful. During this time, I think that Taiwan only big cities are crowded. i wish to go with you! 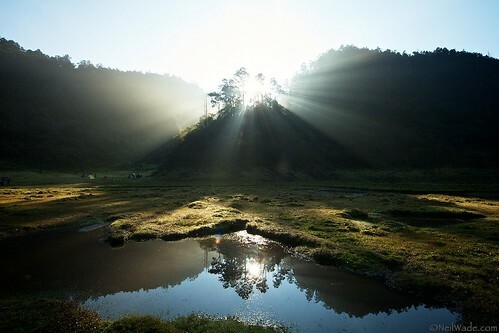 Hi — am planning a trip to Yilin at Easter — will be traveling with my two daughters who are 8 and 6 and can hike for about 3-4 hours with breaks….is Songluohu too difficult for kids? 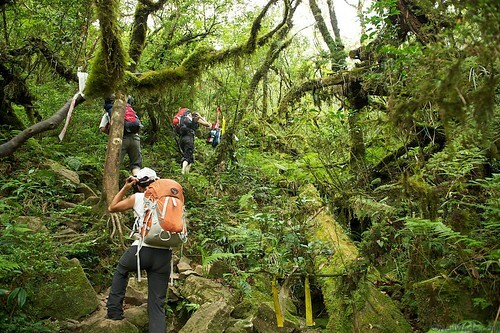 they can manage quite steep climbs….but my concern is when there is no trail….any thots?